Biotin is a very important B complex vitamin that helps the body convert food into energy. The water-soluble vitamin is especially vital during pregnancy and breastfeeding. t’s also needed for blood sugar balance, brain health, heart health, adrenal and thyroid function, and maintenance of healthy skin, hair, and nails. Biotin was once called coenzyme R. This is because it acts as a coenzyme in the body, helping to metabolize glucose, amino acids, and fatty acids. Basically, when we consume macronutrients carbohydrates, proteins, and fats through our food, biotin must be present to convert them into energy, which is required for proper physical and mental functions. Biotin is also called vitamin B7 and vitamin H, which stands for German words Haar and Haut that translate as “hair and skin.” Although biotin is often added to skin and hair beauty products, experts believe that the vitamin is not well absorbed into the skin. The health benefits of biotin are best obtained from ingesting biotin-rich food sources, and certain B complex supplements. Biotin is found in fish, organ meats, egg yolks, legumes, avocado, and more. Biotin deficiency is uncommon in developed countries among populations with sufficient caloric intakes. So many whole foods provide biotin, the recommended daily requirements are considered quite low, and it is believed that our intestinal bacteria can create some biotin as well. Since it is water soluble, any surplus amounts of biotin present in the body get eliminated through the urine within a few hours. So, there are no biotin reserves, making it very difficult to obtain too much. Ideally, small amounts of biotin must be ingested daily to get the body’s supply at high levels. People at risk of biotin deficiency include those with intestinal malabsorption issues or severe digestive disorders like celiac disease, Crohn’s disease, ulcerative colitis, or leaky gut syndrome. Prolonged antibiotic use or long-term use of certain anti-seizure medications may also increase the risk of biotin deficiency. What are the health benefits of biotin, aka vitamin B7? Biotin benefits so many different parts of the body. One of the most important roles of biotin is how it impacts women during pregnancy and breastfeeding. It is estimated that a mild biotin deficiency is common in up to 50% of pregnant women. Deficiencies occur due to faster biotin breakdown during pregnancy, and may cause birth defects. It is best to consult a doctor or nutritionist/dietitian for the best supplement approach during pregnancy and while nursing. Biotin is also needed to repair and build muscles and tissues while also reducing inflammation that can lead to joint or muscle pain. Biotin is also necessary for healthy metabolism; improving glucose intolerance and balancing blood sugar; maintaining healthy hair, skin, and nails; protecting brain function; and supporting the thyroid, adrenals, and cardiovascular system. 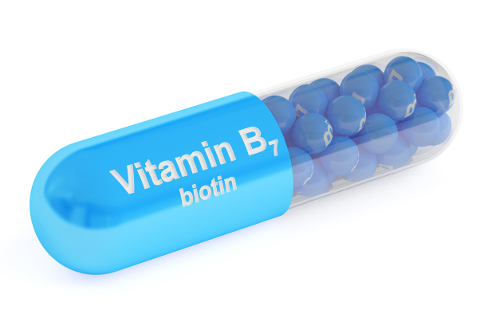 The following is a detailed synopsis of seven key biotin health benefits you need to know. Biotin plays a crucial role in regulating gene expressions needed for healthy metabolism and energy production. Biotin uses amino acids from proteins, activates fatty acids from foods with fat like avocado or oils, and converts glucose from sugar and carbs to produce useable energy source. Once the body can use macronutrients from food for energy, normal metabolic function can occur. Biotin also improves the utilization and metabolism of glucose, which heavily benefits type 2 diabetics. Sluggish metabolism can lead to symptoms like fatigue, digestive problems, poor mood, and weight gain. In multiple sclerosis (MS), the protective covering of nerve fibers in the spinal cord, eyes, and brain is destroyed or damaged. This protective material is called the myelin sheath, and biotin is known to have a role in its production. A pilot study published in the journal Multiple Sclerosis and Related Disorders in 2015 found that over 90% of patients with progressive MS had some degree of clinical improvement when using high doses of biotin. While this preliminary data is positive, further study is necessary, and at least two randomized double-blind placebo-controlled trials are currently ongoing. Biotin is needed for the maintenance of healthy nails, hair, and skin. That is why biotin deficiency can produce symptoms like dry skin, or thin, brittle hair. A study published in the Journal of American Academy of Dermatology found that nail thickness improved by 25% in all participants given 2.5 milligrams (mg) of biotin daily for six to 15 months. There was also a reduction of nail splitting. Also, biotin may protect the skin from fungal infections, rashes, acne, and severe cracking and dryness of the skin. Type 2 diabetes is related to impaired insulin function and high blood sugar. Studies have found that the combination of biotin and chromium could help reduce blood sugar levels in type 2 diabetics. Biotin may benefit blood glucose since it facilitates insulin activity. Better insulin response is necessary to balance blood sugar levels. Biotin reduces enzyme expression that stimulates glucose production in the liver. As a result, less sugar releases into the bloodstream. Biotin could also help lower nerve pain related to diabetes. Studies have found that taking chromium and biotin together may improve cholesterol levels. Research shows that biotin increases HDL (high-density lipoprotein), or the “good” cholesterol, while also reducing LDL (low-density lipoprotein), or the “bad” cholesterol. Biotin also could help protect against common heart disease causes, such as plaque buildup in the arteries (atherosclerosis), inflammation, stroke, and heart attacks. Biotin is part of the B complex family of full-spectrum vitamins that also include vitamin B2, vitamin B3, vitamin B5, vitamin B6, and vitamin B12. Taking B complex vitamins together is the best way to ensure results. As a result, B vitamin complex can support brain function, metabolism, nerve signaling, and more. However, not all supplements are created equal. It is best to purchase high-quality minerals and vitamins supplements made from real food sources, and without toxins and fillers. This method allows the body to recognize them as nutrients, and use them as a similar way as they appear in food. There are actually eight different types of biotin; however, the only one found in food is called D-biotin. It is the only type with full vitamin capabilities. This is a key example of why it’s best to get vitamins and minerals from real food whenever you can. What are the best biotin food sources? That answer is not that simple. You see, in 2004, when researchers examined the biotin levels in 51 different foods, they found a varying range of biotin in each food. This is why nutrition authorities like the United States Department of Agriculture (USDA) do not record the amount of biotin in common foods. That being said, certain foods in studies have tested biotin levels, but the amount of biotin still has a significant range difference. It is still hard to tell how much biotin you are getting from your food. Some of the top biotin foods include liver, peanuts, almonds, Swiss chard, salmon, avocado, cauliflower, cashews, sesame seeds, mushrooms, and raspberries. Interestingly, biotin is found in the egg yolk, and not in the egg whites. Not only do you miss out on valuable B vitamins when you discard the egg yolk, but the egg whites may deplete the effects of B vitamins and possibly create biotin deficiency. The following is a biotin foods chart that is a useful tool for learning what foods can help you avoid a biotin deficiency. The chart will allow you to become aware of what whole foods contain the highest amount of biotin. Overconsumption of biotin is not considered a problem, and there have been very few cases of biotin toxicity. Still, vitamin B7 levels may be affected if someone is taking oral antibiotics or anti-seizure medications, or if they have a digestive disorder that disrupts normal levels of intestinal bacteria. Medications like isotretinoin (Accutane) that is prescribed for acne, may decrease biotin activity in the body. Abnormal doses of other B vitamins like pantothenic acid (vitamin B5) can also reduce levels of biotin. Similar to all B vitamins, very high doses of vitamins in supplement form can impact the doses of other vitamins. That is why it is best to take dose recommended on the supplement package unless recommended otherwise by your doctor. Mateljan, G., The World’s Healthiest Foods: Essential Guide for the healthiest way of eating (Seattle: George Mateljan Foundation), 736-737. Palsdottir, H., “7 Health Benefits of Biotin,” Authority Nutrition, Sept. 11, 2016; https://authoritynutrition.com/biotin-benefits/, last accessed June 6, 2017. “Biotin,” PubChem; https://pubchem.ncbi.nlm.nih.gov/compound/biotin#section=Top, last accessed June 6, 2017. Sedel, F., et al., “High doses of biotin in chronic progressive multiple sclerosis: a pilot study,” Multiple Sclerosis and Related Disorders, March 2015; 4(2): 159-169, doi: 10.1016/j.msard.2015.01.005, last accessed June 6, 2017. Colombo, V.E., et al., “Treatment of brittle fingernails and onychoschizia with biotin scanning electron microscopy,” Journal of American Academy of Dermatology, December 1990; 23(6 Pt 1): 1127-1132. https://www.ncbi.nlm.nih.gov/pubmed/2273113, last accessed June 6, 2017. Geohas, J., et al., “Chromium picolinate and biotin combination reduces atherogenic index of plasma in patients with type 2 diabetes mellitus: a placebo-controlled, double-blinded, randomized clinical trial,” American Journal of the Medical Sciences, March 2007; 333(3): 145-153. https://www.ncbi.nlm.nih.gov/pubmed/17496732.